A special way to achieve delicious, juicy roasted poultry! Try this great addition to your kitchen tools arsenal that will make your chicken, turkey, and duck roasting results nice and juicy. 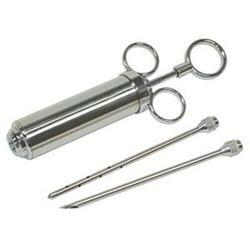 The Bayou Classic 2-Oz Seasoning Injector is made of stainless steel which is durable, easy to use, and easy to clean. This kitchen gadget set includes two 6-inch food and marinade injector needles, long enough to put your choice of seasonings under the skin of the bird. Try a variety of flavors with this injector__cajun, brine, meat flavorings and bbq. Stainless steel construction Offers an attractive, durable product to add meat flavoring to foods. Two finger holes Help achieve a firm grip on this kitchen tool. Loop in plunger for thumb Provides a controlled injection of seasonings into meat. Two long 6-inch meat injection needles Provide one for use plus a spare.